The Minesoft team was thrilled to win the award for Best Business at the recent Richmond Chamber of Commerce Business Awards, and to applaud Co-Founder Ann Chapman-Daniel on her much-deserved win in the Best Female Entrepreneur category. 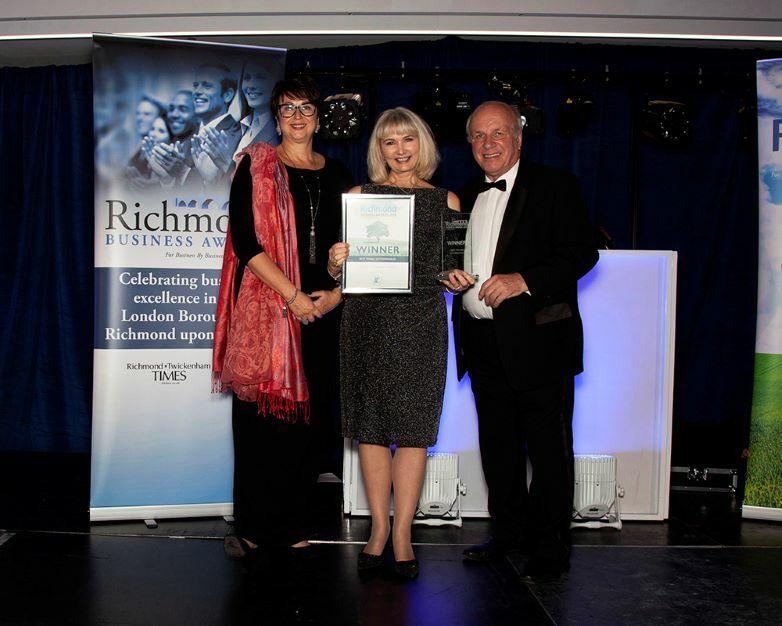 The annual business awards organised by the Richmond Chamber of Commerce – one of the accredited nationwide British Chambers of Commerce – are a recognition and celebration of regional business success. As a global patent solutions provider, we aim to encourage innovation worldwide. Since 2010 we have partnered with the World Intellectual Property Office (WIPO) in the ASPI programme to give researchers in developing countries free or low-cost access to sophisticated tools and services, like PatBase, for retrieving and analysing patent data. In addition, our services and tools provide assistance for international corporations, law firms, patent search firms and universities worldwide, including many FTSE 100 and Fortune 500 companies. Once again, this November, Minesoft was pleased to sponsor the award category Best Business for Innovation, encouraging innovation on a local scale. We offer our congratulations to the award winner, PageTiger, for their interactive, online solutions for HR departments. Minesoft Co-Founder, Ann Chapman-Daniel, is involved with the regional Chamber of Commerce and Richmond Business Investment District to boost local business, ranging from small businesses to corporations, such as eBay and PayPal, and the community as a whole. Ann Chapman-Daniel receives the award for Best Female Entrepreneur, for building a successful company in rapidly changing business environments and donating much of her time to industry associations, the local community and charitable organisations. Minesoft Co-Founders Ophir Daniel and Ann Chapman-Daniel collect the award for Best Business. The judges remarked that Minesoft has a sound business strategy and execution that demonstrates well across all the disciplines, including: people management, customer service, exports, innovation and product development. A very good example of a well-run growth business contributing to the prosperity and well-being of the local area too. Ann Chapman-Daniel and Ophir Daniel pose with Anne Newton (CEO of Richmond Chamber of Commerce), the Managing Director of the Richmond & Twickenham Times, Zac Goldsmith MP, Deputy Mayor of Richmond and Sir Vince Cable MP (leader of the Liberal Democrats party). Minesoft London get the celebrations started at the international Twickenham Rugby Stadium – the home of England rugby. The Minesoft team enjoyed a night of great food and dancing, we look forward to playing a prominent role in the Richmond Business Awards again in 2019.